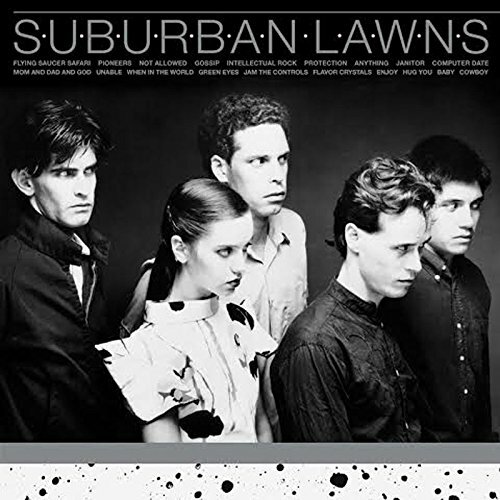 Discussions Magazine Music Blog: SUBURBAN LAWNS - SPAZ reviews the expanded CD edition of their debut album! SUBURBAN LAWNS - SPAZ reviews the expanded CD edition of their debut album! The first thing one notices about Suburban Lawns’ music is how timeless it is. Quirky and odd, yes, but the songs on this expanded reissue of their debut album still sound fresh and exciting. Originally released in 1981, this SoCal band had been called New Wave and Post-Punk, yet they transcended those genres and created an odd mix of quirky pop that was definitely unique. Imagine the jittery rhythm of early Oingo Boingo and Devo, the snotty attitude of The Waitresses and the artsy Pop of Talking Heads, strip back the production just a tad and you’ve got Suburban Lawns. With male and female lead vocals, the album touched on a lot of musical styles cleverly weaved in and out of their eccentric songs. While the tracks were most certainly a product of the Punk, Post-Punk and New Wave era, they still sound electric and exciting. Even after hearing this album numerous times for three and a half decades, it hasn’t lost its charm. The songs are so clever, riveting and catchy - its a shame that the band are not bigger cult heroes. Perhaps the best album to compare it to, sonically, would be Devo's debut, Q: Are We Not Men... but even that doesn't describe this aural trip into the musical unknown! The album is joined here by five bonus tracks – including the Baby EP. However, it does NOT feature their classic debut single “Gidget Goes To Hell.” That might be a licensing issue or maybe the band felt it didn’t fit in with the rest of the tracks. Let’s be honest, though – this release does not suffer from the loss of that track. This long-awaited expanded edition of Suburban Lawns’ self-titled debut is definitely one of the best reissues of the year and is damn near perfect. With that being said, if it was released today, it would most certainly be one of the most smashing debuts of the year! Normally, my reviews are a bit too wordy as I share my thoughts and feelings on an album. For some reason, I'm still transfixed by this music some 35 years on and I can't seem to find the words to describe just how oddly wonderful it is. This is the moment that YOU have to take action - time for you to buy the damn thing!